We had landed at Shannon Airport, and were now in a bus heading for Cork via Limerick. Some photogenic sights swept by, such as hundreds of cows grazing on rolling, utterly green hills, and colorful little houses lining the main streets of tiny towns. I was ready with my camera but, unfortunately, between the shaking of the bus and the window barrier, photo ops were lost. It was still early in the day when we arrived in Cork. Here, at Juryâ€s Inn, we would stay until the following morning, before continuing to Sheepâ€s Head Peninsula, where Peggyâ€s Stone Cottage awaited â€“ our little home away from home for the next few days. As it happened, Cork was celebrating its annual marathon. Several streets were cordoned off and packed with runners, loudly cheered by enthusiastic onlookers. Tumultuous, but then came tranquility, after I decided to take a leisurely walk along the River Lee, enjoying the views and, along the way, discovering that the river splits into two as it flows through the city center. 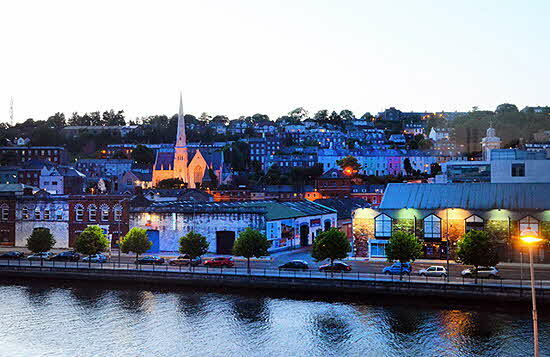 Jury’s Inn, located next to the river and just a three-minute walk from the bus station, proved comfortable -boasting good service and, not least, a superior view of the city across the River Lee. Before calling it a day and catching up with jetlag, the three of us, Roxie my wife, her sister Ann, and I, met for dinner at Thomond Bar, very much an Irish establishment, offering conviviality and simple but satisfying fare. A bus the following morning had taken us to Bantry, where, at the Tourist Office, we immediately ran into a man who not only counted Peggy, the cottage owner, as a friend but who had worked for the State Department in Washington DC, and often visited Ann’s nearby hometown, Annapolis. 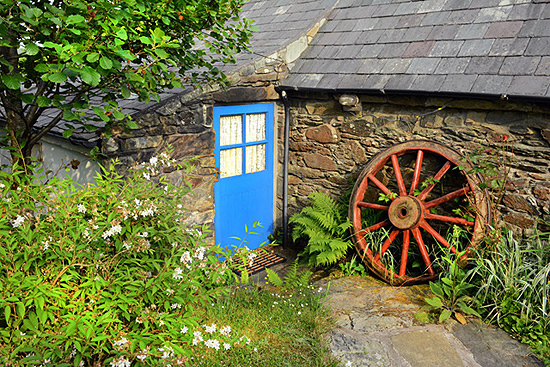 When Joe, the man in question, offered to drive us to Peggy’s Stone Cottage, we were only too happy to accept. But first we picked up groceries and, at Joe’s recommendation, lunched at The Snug, a cozy pub, clad in dark wood. 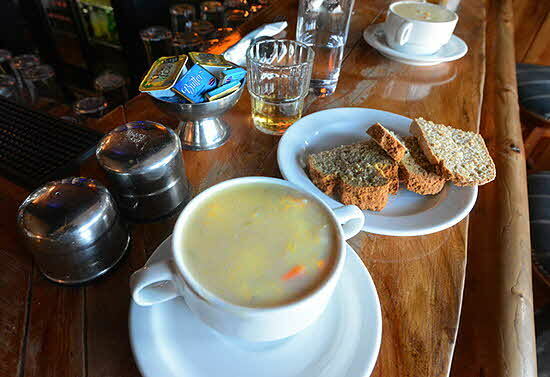 I recall its delectable seafood chowder and tasty Irish soda bread. On the way to the cottage, Joe generously took us on a short sightseeing trip around Sheep’s Head Peninsula, which has been described as peaceful and unspoiled, with some of the most beautiful scenery in all of Ireland. No doubt about it. I was particularly struck by how unbelievably green it all was. 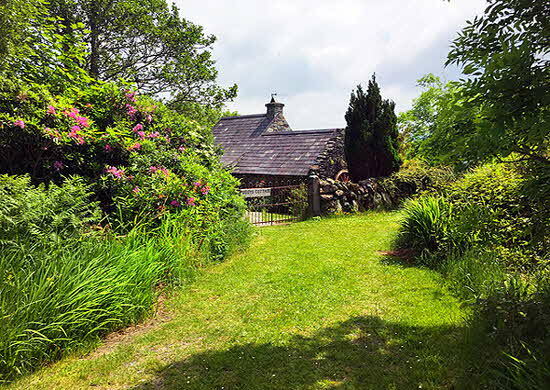 And here we found Peggy’s Stone Cottage, barely visible from the narrow country road. The main part of the cottage was 200 years old, and required warning signs on top of two of its doorframes. Everything was snug and homey, with a tiny sitting room with a fireplace, a fairly spacious kitchen, two bedrooms, and, in the back, a verdant garden. Reading the instructions left by Peggy, and written with American tourists in mind, I was struck by the line: “If you’re not American, please forgive the obvious.” She then went to great lengths explaining the handling of the fireplace, after which she recommended a meeting with Paddy Moynihan, the caretaker and family friend from a nearby farm. With a population of only about three hundred, Durrus, in true Irish spirit, sported several good pubs. We first visited Ross, where I marveled at the superior taste of its Guinness. Later, before returning to the cottage by taxi, we enjoyed a light dinner at O’Sullivan’s Bar. Days of bucolic bliss followed. One morning, a baby frog crouched by the bedroom door. 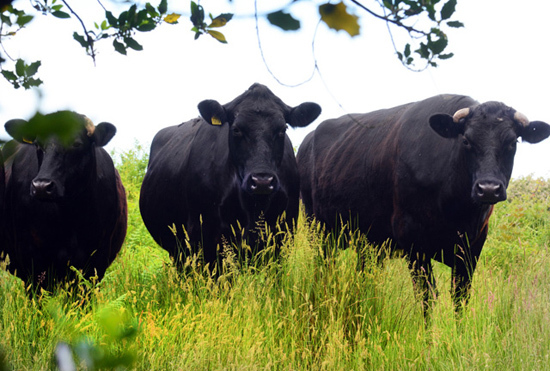 And up-close, outside the window, stood three black bullocks, peering at us in a meditative fashion. 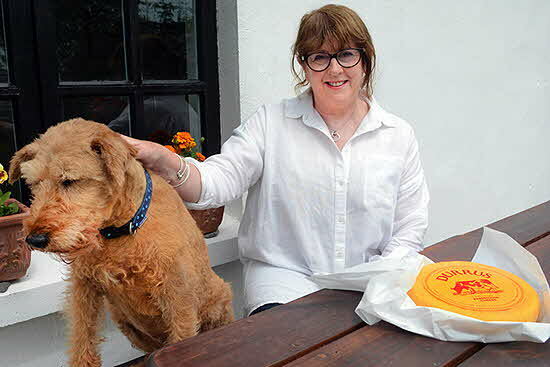 I visited Durrus Cheese Farm, just a couple of minutes walk from our cottage. Knowing that its semi-soft, washed-rind cheese made with unpasteurized milk, was famous and had won several awards, including a Gold Medal. I was anxious to taste it. I also looked forward to meeting with Jeffa Gill, the founder. One morning, strolling along the highly recommended, but long, Coomkeen Loop Walk, Roxie and I began feeling dehydrated, only to realize that we had neglected to bring water. So, sighting a house in this mostly unpopulated area, we just knocked on a fence gate, hoping someone would be there to help us out. There was â€“ an accommodating woman named Linda who, not altogether unsurprisingly, turned out to be a good friend of Peggyâ€s. A lively ten-minute chat and we thought of her as a good friend of ours as well, and left replenished and more informed about the region. 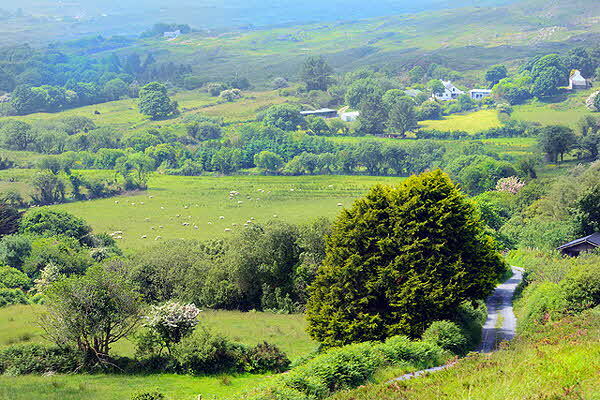 On another occasion, our favorite local taxi driver, Carmel, picked us up and drove us to Bantry, where we took a 20-minute bus ride to the village of Glengarriff. There, a tiny ferry took us to the small island of Garnish. On the way we sighted a seal sunning on a rock, at which point the ferry made a quick turn, enabling us to take a closer look. Renowned as a tourist attraction, Garnish proved well worth a visit, boasting an old restored tower from the Napoleonic wars, some rather spectacular gardens, and a welcoming café. 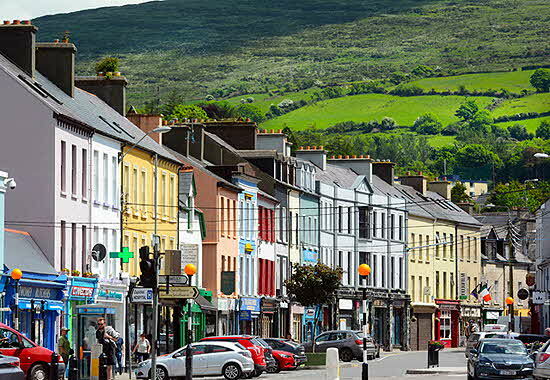 Back in Bantry, it was time for some more grocery shopping and a quick visit to The Snug. Nothing, I dare say, beats a good Irish pub for geniality... with everyone ready to talk and tell a joke. As we were about to leave, the guy standing next to me pointed to his drinking pal, and said: “He’s celebrating his retirement. And he hasn’t worked a day in his entire life. A goodbye chat with Paddy, the family friend who lived nearby, and, once again, we were off to Bantry with our taxi driver Carmel. 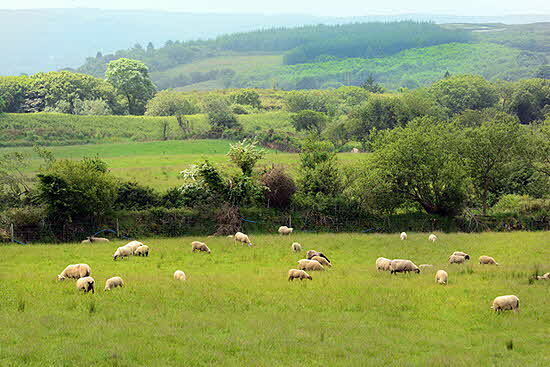 From there, we headed by bus to Tipperary, where we would stay until the next morning, before continuing on to Shannon Airport and New York City. I could well believe it. 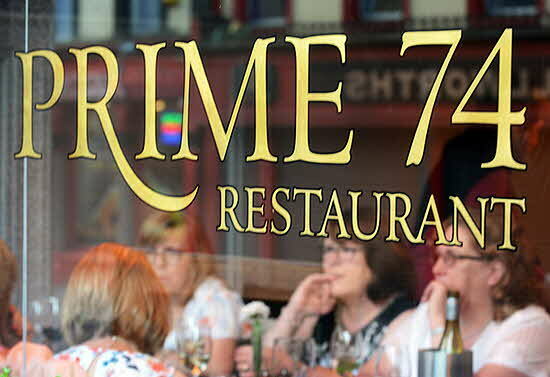 Intimate and busy, Prime 74, run by chef and proprietor Martin Lovwell, served great food, everything locally sourced, and with the names of the producers included on the menu. I picked Crispy Monkfish from the a la cart menu; Roxie chose Corn Fed Chicken with smoked bacon, wild garlic, mushrooms, and asparagus; and Ann decided on Seared Scallops & Pork Belly, with cauliflower and wild mushrooms. And we all shared seasonal vegetables, which happened to be string beans and turnips. Finally, for dessert we shared a Rhubarp Panna Cotta, with buttermilk, apple, caramelized ginger, and ice cream. As for wine: a bottle of La Ferme Petit Paul Chardonnay arrived at the table. And we all raised our glasses to the Emerald Isle. © October 2018 LuxuryWeb Magazine. All rights reserved.